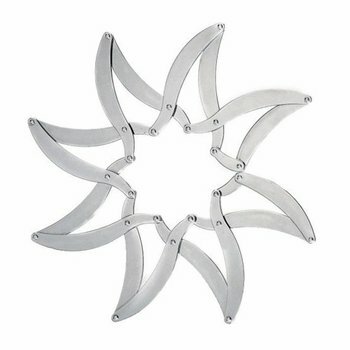 This trivet is a star of transformable design. And so are its creators, Donato D'Urbino and Paolo Lomazzi. The same team that brought us the Pescher Extensible Trivet by Alessi also designed the Augh. The two designs are a nice study in contrast: where the Pescher is a linear piece that flexes in a straight line, the Augh travels in circles, or star-forms, to be more precise. Move the jointed 18/10 stainless steel arms around and let the trivet morph into any number of beautiful shapes and sizes. In its star formation the Augh trivet measures 9 1/2 in. (24.1 cm). in diameter. Finished in mirror-polished stainless steel.